Give your remote team the advantage of up-to-the-minute information with the automated synchronization capabilities of GoldSync. GoldSync makes updating and distributing vital customer information a productive reality. GoldSync easily extends GoldMine information to your remote users regardless of where individuals are located. 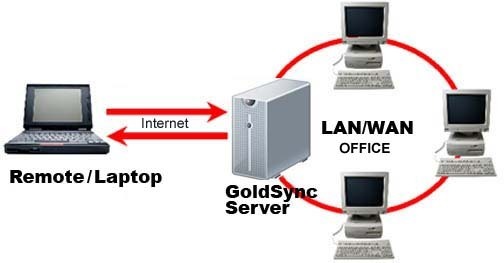 GoldSync allows for employees who work remotely on the the go via a laptop, satellite office, or home office to have access to GoldMine on their laptop/pc and the changes/updates they make in GoldMine are synchronized to the main GoldMine Server. Complete control – Distribute information to GoldMine® users and sites using filters to control the content sent to each location or representative, thereby eliminating possible territory conflicts. 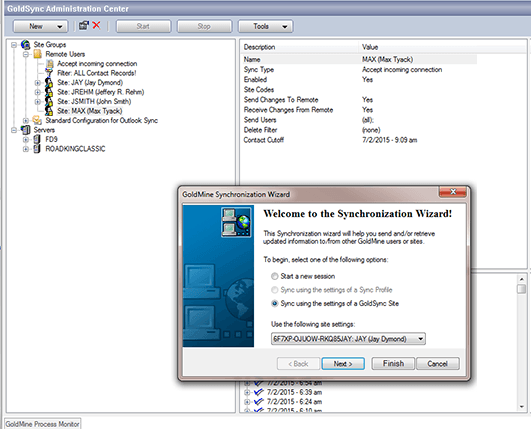 Determine when, what and how information is synchronized with automated agents functions. Protect your information – The three levels of synchronization security include serial number, site ID and optional user password validation.